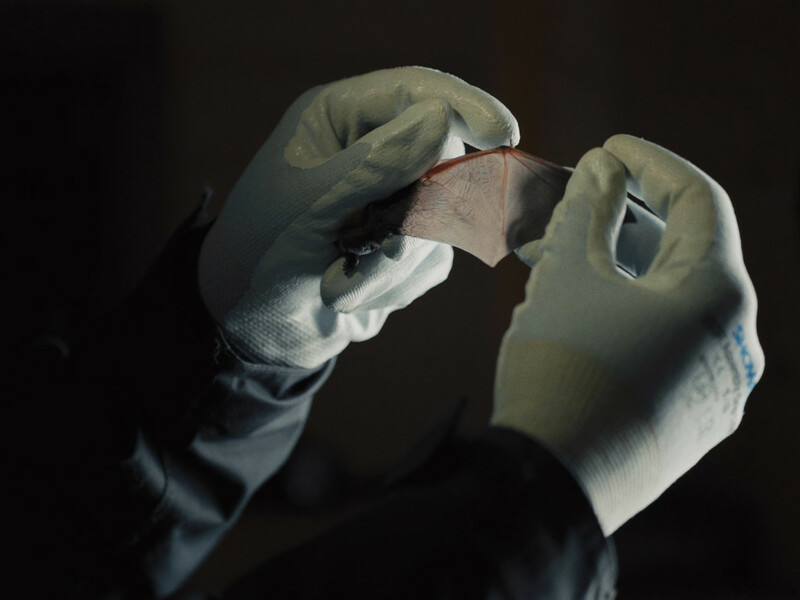 The maligned bat, which Thomas Nagel described as so far out of human experience as to be “fundamentally an alien form of life” 3, is the only mammal that can achieve sustained flight and, as such, occupies a liminal space between earth and sky. This indeterminacy perhaps explains why they have been so often associated with witchcraft and disease. But bats have barely changed in millions of years and, as Dr. Andrew Kitchener, interviewed zoology curator, points out, while lovingly nursing a fossil bat “getting on for fifty-million years old”, that they seem to have “magically” appeared out of nowhere, fully-formed, at a point soon after the dinosaurs died out. I am reminded of a cartoon of a green dinosaur asking a human being the time… I digress… Ironically, Francisco Goya’s age of reason etching, The Sleep of Reason Produces Monsters, 1797, depicts the more common view of the bat as a symbol of darkness and ignorance. Yet this hugely misunderstood creature serves as valuable companion to humans and clearly predates us on their planet. By combining field and location recordings – lyrically shot at night in Scotland4 – archive footage, and interviews, over-laid with a highly affective soundtrack, Brennan juggles experiential and evidential modes. The film charts Donald Griffin’s pioneering studies of bats in the early 1940s5 which opened our eyes (and ears) to their extraordinary methods of navigation, and provided the basis for an understanding of echolocation and develops the seminal Griffin/Galambos footage of their “flying bats avoiding objects” experiment (1941) into a rich seam of sonic and geological investigations. Including further and strangely beautiful historic US marine underwater filming of ‘silent’ explosions, endearingly and brilliantly, ‘nerdish’ interview voice-overs, Brennan looks backwards and forwards over an unimaginable span of geological time, to remind us of the mysterious landscape beneath our feet as well as the unheard soundscape going on above our heads. Brennan cites Donna Haraway and Bruno Latour’s ecological writing as influences, wherein Haraway’s call for a “multi-species assemblage” seems particularly pertinent. Coining the neologism Chthulucene (pronounced thulu-scene), Haraway’s writing demands an “inter-woven and symbiotic” relationship between human and non-human protagonists, with the de-centered human working against “bounded individualism” 6 (sound familiar?). Brennan’s title, Listening in the Dark, can thus be read in two ways; it invokes bats’ sophisticated echolocation and reads as a call to action. Listening requires attentiveness to the demands of our planet and other species. At the film’s end, a rolling text states that reefs are returning to offshore wind farms that in turn, are attracting seals. Unlike the powerful and distressing mental image of the dying bats, it’s an unintended beneficial consequence and a moment of qualified optimism. Maeve Brennan is an artist based in London. She works with moving image and installation to explore the political and historical resonance of material and place. Recent solo exhibitions include The Drift at Chisenhale Gallery, London; Spike Island Bristol and The Whitworth, University of Manchester (all 2017) and Jerusalem Pink, OUTPOST, Norwich (2016). She was educated at Goldsmiths, University of London and was a fellow of the Home Workspace Program at Ashkal Alwan in Beirut (2013-14). She is a co-founder of Sharna Pax, a film collective working between the fields of visual art, anthropology and documentary. She was the recipient of the Jerwood/FVU Award 2018. Listening in the Dark was commissioned for the Jerwood/FVU Awards 2018: Unintended Consequences, a collaboration between Jerwood Charitable Foundation and Film and Video Umbrella. FVU is supported by Arts Council England. 1 Claudia Gebhardt, bat ecologist and voice-over contributor to Listening in the Dark. 5 Sonorously narrated by J. David Pye, himself the pioneer of the Ultrasonic Bat Detector. Please note that Listening in the Dark runs for 43 minutes and 30 seconds. Screening times at the gallery (Thu – Sat) are as follows: 12:00, 12:45, 13:30, 14:15, 15:00, 15:45, 16:30, 17:15.